Taub Center research shows that expenditures exceed income for the vast majority of Israeli households – across population groups and in all but the top income quintile. Low wages coupled with the high cost of consumer goods and housing – basically, the challenge of making ends meet – have been a great concern for a large number of Israelis in recent years. Taub Center researcher Eitan Regev explored the economic situation of households in recent research published in the State of the Nation Report 2014. 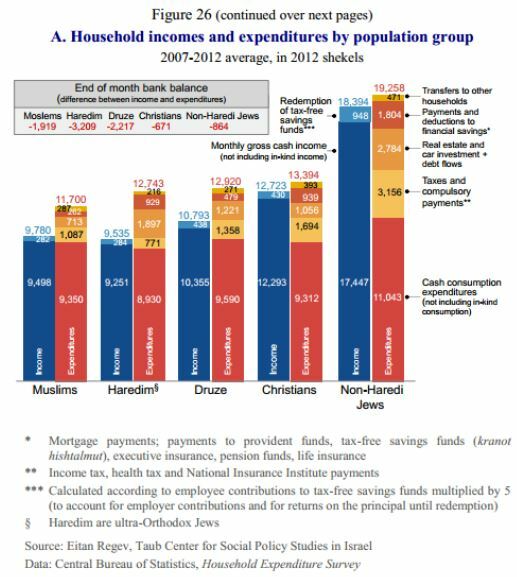 Regev undertook a comprehensive analysis of household income and spending, and explored differences among population groups (Muslims, Haredim (ultra-Orthodox Jews), Druze, Christians, and non-Haredi Jews) as well as between income quintiles. His research highlights some unique findings with regard to income and savings among the Haredim, and points to the overall challenges that the vast majority of Israelis face in making ends meet. While the public discourse commonly relies on a comparison of income versus consumption, the focus of Regev’s study was slightly different – namely exploring the relationship between a household’s total income and its total expenditures, which include, but are not limited to, consumption. In other words, the study asked: are Israeli households spending within their means or are they in deficit? The first figure compares monetary household income and expenditures by population groups. Household income comes from a range of sources, including cash income from wages, capital, benefits from both government and non-government sources, and pension funds. In addition, household income includes the average monthly value of income from the redemption of tax-free savings funds (kranot hishtalmut) – which is received as a one-time lump sum, generally after six years. Household expenditures consist of spending on consumption; taxes (income tax, social security, health tax); personal capital invested in a home or a car and down payments made on these; expenditures on financial savings including monthly mortgage payments and payments to pension, provident, and tax-free savings funds; and transfers to other households (alimony, child support, gifts, etc.). This analysis reveals the substantial gap between total household income and total expenditures among Israeli households, showing that, on average, all population groups in Israel consistently find themselves with a deficit at the end of the month, with their income unable to cover their expenses. Israeli Christians have the smallest gap between the two, with a deficit of NIS 671 per month. They are followed by non-Haredi Jews at NIS 864. Israeli Muslims and Druze fall somewhere in the middle, with monthly expenditures exceeding monthly incomes by about NIS 2,000. Haredim have the greatest deficit by a wide margin, with expenditures that are, on average, NIS 3,209 higher than their income on a monthly basis. This gap is equivalent to almost one-third of the monthly income of Haredi households. A major reason for the large gap between the income and expenditures of Haredim is due to the heavy spending on home purchases by this population. 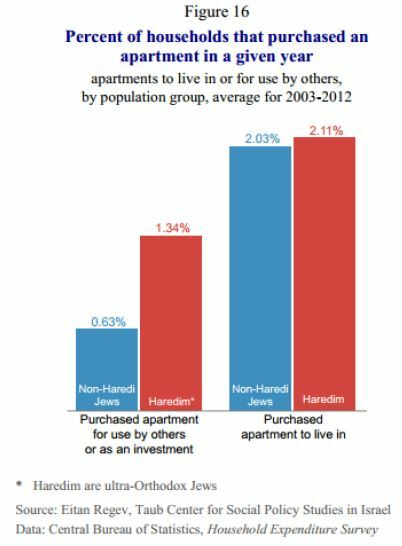 The second figure shows that while similar rates of Haredi and non-Haredi Jews purchase homes to live in, Haredim are much more likely to purchase homes for use by others or for investment purposes. In the decade between 2003 and 2012, 0.63 percent of non-Haredi Jewish households purchased a home for use by others or as an investment in a given year. That figure was more than doubled, at 1.34 percent, for Haredi households. Haredi households, on average, spend NIS 1,182 per month on housing that is not for their residence, in comparison to only NIS 425 among non-Haredi Jews. The difference in home purchase patterns stems from the fact that, in comparison to other Israeli households, it is more common for Haredim to purchase residential real estate for investment purposes and for Haredi parents to purchase a home for their children prior to their marriages. In recent years, real estate investment seems to be increasingly viewed by the Haredim as an investment vehicle that can be used as a source of income while allowing for Torah study. A key question remains regarding the income sources that support real estate purchases among the Haredim. Interviews and data presented in Regev’s chapter suggest that Haredi benefit societies (charitable organizations known as gemilut chasadim) play an active role in this regard. It is likely that these benefit societies provide loans to Haredi families – disguised as donations – which are often funded from foreign sources via money laundering schemes. While home purchases are indeed a savings avenue that can offer financial rewards in the long term, down payments and monthly mortgages often lead Israeli families to be in the red. As housing prices rise, Israeli families are increasingly taking on larger levels of debt. Dr. Noam Gruber in the State of the Nation Report 2014 shows that there has been a real increase of about NIS 70 billion in mortgage debt, and the share of mortgage debt out of all household debt has increased from 67 percent to 70 percent in the last five years. Soaring housing prices and increased indebtedness due to housing are key factors causing Israeli families to struggle to make ends meet. Young couples frequently rely on assistance from parents in order to purchase a home and avoid an overdraft in their bank account. In cases where such help is unavailable, home ownership often becomes unattainable. Regev’s research shows that, on average, Israeli households across population groups and in all but the top income quintile are unable to make ends meet. A pattern of negative savings is likely unsustainable, and leads to questions about the ability of Israeli families to succeed economically in the long term.